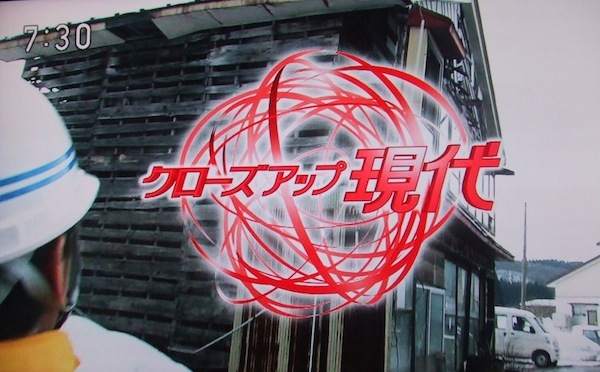 Last Wednesday, NHK’s in-depth news series, Closeup Gendai, covered the issue of abandoned houses (akiya) in Japan, a topic we’ve addressed several times on this blog. Though the report left out a number of points that we think are essential to the discussion, there is only so much NHK can cover in half an hour, and what they did cover was well considered. Of the major broadcast media, perhaps only NHK can do this since they do not have to worry about offending advertisers. Right now house manufacturers and developers, both of which rely on new housing construction for their livelihoods, buy huge amounts of broadcast time. Certainly the most important point that NHK made in the report is that the nation’s focus on new housing as a means of keeping the economy afloat is not sustainable. The program reiterated a lot of statistics that we’ve already reported, in particular the figure of 7.57 million homes–single-family houses and condos–that stand vacant in Japan. That’s 13 percent of all residences. Of these, 1.81 million are classifed as being abandoned, meaning not only are they vacant, they are not for sale or rent either. They are just sitting there, about to collapse, all the while attracting garbage and arsonists. Thus they are not only eyesores but safety hazards, and the source of complaints by neighbors, who ask their local governments to do something about them. As we discussed in an earlier post, some localities have passed regulations that allow them to confront the problem, which is difficult to do because, as NHK pointed out, there is a “taboo” against public entities forcing themselves into matters having to do with private property. The model of this new public action is the city of Daisen in Akita Prefecture, where, as of 2011, there were 1,415 akiya. The problem was so bad that the city passed a law allowing authorities to demand of owners that such firetraps be torn down and if the owner did not respond then the city can move in a carry out the demolition itself. Sixty-one houses were initially targeted for action, but so far only two have actually been torn down. The main problem is locating the owners. As it turns out, many have never even registered the properties, which, of course, is illegal, and the first question that we thought of was: If a house was not on the city rolls, it means the owner never payed property taxes, so what was the city doing all these years? NHK didn’t ask that question. It did find the owner of one derelict house who said he had inherited it from his aunt but didn’t have the money (¥700,000) to tear it down. He thought he might be able to sell the land and then use the proceeds to pay for demolition, but he couldn’t find a buyer. So the city tore the house down and, presumably, absorbed the cost. Though the program didn’t say as much, it seems obvious that such a small city cannot afford to tear down every abandoned house in its jurisdiction. The report was especially thorough when it discussed the issue of saikenchiku-fuka, or houses that cannot be rebuilt because of access problems. We covered this issue in our most recent Home Truths column, but NHK was able to get statistics that we looked for but couldn’t find. Concentrating on Tokyo’s Adachi Ward, which contains a lot of neighborhoods of densely packed residences, NHK explained that the rebuilding prohibition itself has led to a situation where many old houses are simply abandoned. So far, the ward, which also passed a forced demolition regulation, has instructed the owners of some 200 buildings to tear them down, but only about 20 percent have agreed to do so. One of the obstacles is the property tax system. A plot of land zoned for residential use that does not have a house on it is taxed at six times the rate of land that does have a house. According to the saikenchiku-fuka law, if the access road/path from the property to the nearest public road is two meters or less in width, any structure on the property cannot be rebuilt, the idea being that access roads must first be widened in order to make the neighborhood safer. But if the owner tears the house down and doesn’t replace it with something new, his tax bill increases sixfold. In Akita prefecture that might not be a big problem, but in Tokyo it can run into huge amounts of money. The Adachi Ward official interviewed by NHK said there are 8,541 vacant houses in the ward, a figure that even shocked us. It doesn’t mean all these residences are abandoned, but the number is increasing every day because of the area’s large number of elderly. NHK brought in Kobe Univ. professor Yosuke Hirayama as the studio commentator. He talked frankly about the short-sightedness of a national policy to promote new housing construction, which the government bolsters with tax incentives and loan guarantees for new houses, not older ones. After all, it was the housing push among boomers that led to the bubble economy of the 1980s. He clarified a point that we’ve been talking about on this blog, that the single-minded push for new housing has created a “stock” of substandard used housing since the authorities don’t care about used housing. As a result “Japanese people don’t cherish their homes.” They don’t take care of them or improve them because they aren’t encouraged to think of their homes as long-term assets. He repeated the oft-quoted number of 30 years, which is how long Japanese homes are expected to last. Though he didn’t mention it, property tax laws also reinforce this idea, since any improvement done on a home, either cosmetically or structurally, adds “value” that increases one’s property tax bill, even if it doesn’t realistically boost the resale value of a house. This was the one area that NHK didn’t go into, at least not in clear detail. But one could infer this fact of economic life from the discussion, which was quite well developed. Hirayama pointed out that in Europe there is very little new house construction because governments encourage home improvement. He said the Japanese government could do the same thing and, in fact, must do the same thing since the lingering recession and the declining population make new housing construction less economically viable. He said the housing stock in Japan now stands at 50 million. Last year, 800,000 new homes were built. If investements were made to improve those 50 million homes, the revenues would far outstrip the amount of money currently being spent for new homes. There would be enough stimulus for years. What he didn’t mention is that the majority of those homes are in such bad shape as it is that the incentive may be less than meets the eye. The show also didn’t talk about land prices, which are the root of the problem, and land usage, especially with regard to housing developments, which influences housing design and quality. Mainly, the report’s purpose was to talk about the issue from the standpoint of “social capital,” and, as is NHK’s editorial habit, it ended with a segment showing how some local governments, in this case Nakasaki’s and Matsue’s, were addressing the problem in a positive fashion. But it’s obvious that the problem cannot be solved until the central government gives up its policy of promoting new homes at the expense of older ones. Enjoy the blog, though I only check in very occasionally. I lived in Tokyo for 15 years in the 80s and 90s, and enjoyed it immensely. My sense from reading this the past few years is that you will never buy. 🙂 Sorry to inform you of this, but you seem a similar psychology to me, and when you have a fundamentally skeptical approach to a complex issue like buying a house, the default decision is always ‘no’ (in case you haven’t noticed), and it takes something exceedingly unusual to tip the scales to ‘yes’. At the same time, if you treat your house search as simply an excuse to delve into Japan and all its mysteries and quirks, it provides a lot of entertainment. Thanks! now my question: what? what is going on with Japan’s land laws as it relates to abandoned houses (as above)? my “romantic dream” is to buy an old grass roof house in the countryside (I have found a few, and now one is in my sights about a two hour drive from here in Himeji) but a local “redevelopment” company looked into the ownership (ostensibly) to do the reforming work, but could not find the owner to contact about selling, etc. seems nothing is straight forward here, any suggestions? It’s essentially the same process in Japan. You go to the local homu-kyoku, to the land registration office (tokibo), and look up the property on a map. The map should tell you the owner’s name and his/her present address. We assume the redevelopment company did this. The problem is that often the owner is no longer at the address registered, probably because he is dead. The reason the company couldn’t locate the present owner is that the heirs didn’t bother to change the title to their name, and if several generations have passed since the titleholder died, that means every heir has a say in the sale or liquidation of the property. It’s a lot of trouble, so the company may have felt it’s not worth it. However, you can hire a lawyer who should be able to find either the present owner or the nearest relatives, but in any case the homu-kyoku isn’t going to tell you if you can’t prove you’re related to the titleholder. Supposedly the government is working on changing the law so that such transactions can be made smoother. We wrote about it recently. I will try to find what information I can from the city: owner’s name and address (which, as you say was probably done already) when the place was built (important to me as an architect: the older the better), utility services that may be extant, boundaries, etc. I’m so curious about this tax on improvements, what sort of updates to the house does it cover? Even cosmetic ones?